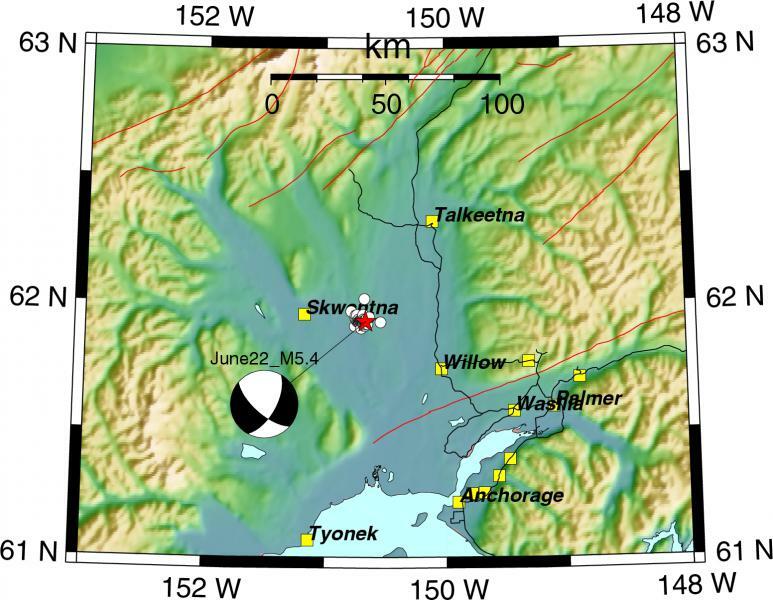 On June 22, 2009 at 11:28 am AKDT (19:28 UTC) the Alaska Earthquake Information Center located a magnitude 5.4 earthquake, 38 miles (62 km) deep, about 17 miles east of Skwentna (red star on the above map). AEIC staff have located about 50 aftershocks through 9 am AKDT of June 26 (white circles on the above map). The largest aftershocks were three magnitude 4.1 events that occurred half-hour, 21 hours and 4 days after the mainshock, respectively. The mainshock was felt widely in southcentral Alaska and as far as Homer in the south, Fairbanks in the north and Cordova in the east. Some aftershocks were also felt over a smaller area. No reports of damage have been received. Maximum intensity of shaking was in Trapper Creek, V, light. The tectonic framework of Alaska is dominated by subduction of the Pacific plate underneath the North American plate along the southern Alaska margin and the Aleutian Islands. In southern Alaska earthquakes inside the subducting plate occur down to a depth of 130 miles (220 km). According to its depth, the M5.4 earthquake and its aftershocks occurred inside the subducted Pacific plate. These events are common in the Cook Inlet region. On average during last 20 years, one earthquake of mangitude 5 or greater occurred in a 100 mile radius of the June 22 event, and once every two years in a 50 mile radius. Waveform modelling and analysis of the P-wave first motions of the M5.4 earthquake and its aftershocks indicate normal type of faulting. As the Pacific plate slides into the mantle, it is being pulled by its own weight causing extensional earthquakes.